Dear Friends and digital enthusiast, we have always been reading and talking of personalization, but have we tried to build a digital web and digital marketing mix in line with a conventional marketing mix. Every organization has to identify their visitors across touch points. Through customers organizations tend to learn and improve their channels. One can understand the intentions, likes and trouble points through analytics. This information when churned through Big Data will create an awesome picture of Customer Journey Analysis (CJA). But this CJA comes with huge amounts of Capex through hardware, software and engineers. This entire data driven CJA will be a tremendous asset if known how to use it. But how should organizations plan to utilize this. Organizations should utilize this CJA data by building a Digital Marketing Mix (DMM). This DMM will be similar to a workflow or platform through which Organizations can build communication channel with its customers and visitors. Here this 3 dimensional metrics clearly communicates where a customer will fall in according to his behavior and journey. How an organization can take advantage of such customer in its reach. 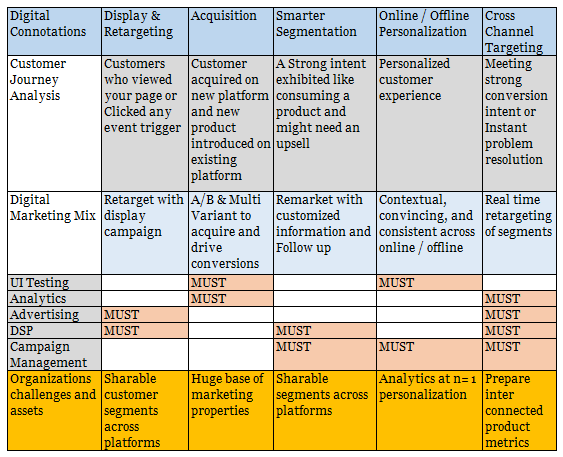 What platforms and tools does an organization should look to employ and what will be the key challenges for an organization to deploy and execute its marketing digital campaign. This post is specially written by Bala Raghavendra Prasad for SEO in Short. A good read. The 3d matrix pretty much sums up the touch points during a customer journey. Strongly recommend for seo learners.